I used to frequent Vogue Cafe during my first year of uni, they did a delicious gnocci rosa which kept bringing me back but then was sadly taken off the menu. The years passed, and I didn't think much of the Cafe, it was never really a super popular spot amongst the uni crowd. But this year, Vogue Cafe returned to my radar when it kept popping up all over Instagram, in particular their fun milkshakes. Over the weekend I returned to Vogue Cafe with my uni girls and we were shocked to see what Vogue Cafe had become over the years! It had a complete makeover (I understand that during Macquarie Centers re-branding it had shutdown) and had gone from what was an almost stuffy cafe which suited an older crowd to a cute, quirky, garden like cafe. When we got there all the tables were full so a waitress took down our name and number and said she would call us as soon as a table was ready. The perks of a cafe being located in a shopping centre is that you can window shop while you wait, but we had barely entered H&M when we got the call that our table was ready. Once seated, I ordered the Nutella milkshake and French toast with berries and yogurt. We were warned that our orders would take at least 20 minutes to arrive, which was fine by us as we weren't starving and were happy to chat. The drinks arrived first and we were all in awe at how cool they looked, very instagram worthy! We joked that getting to the milkshake was like going through a lolly obstacle course, a course I wasn't complaining about! I really enjoyed the shake; thick and devilishly chocolate-y. Perfect for someone with a sweet tooth. When my french toast arrived, I was already nearing full and ordering a sweet meal with such a sweet drink wasn't the best idea. It was served on a rectangle black plate, that reminded me of charcoal, and although it looked cool it wasn't practical as the juice from the berries kept spilling over the sides. And although the french toast was nice, I couldn't even finish half. Most of the girls were the same with their meals. We all enjoyed our meals but could barely get through them as our drinks had filled us up! So I would recommend if you are going for the drinks, perhaps get a light meal to share. Or have a heartier appetite than us! Overall, I enjoyed my experience at Vogue Cafe. The service was friendly despite being slow, and the menu items created conversation and hashtags. 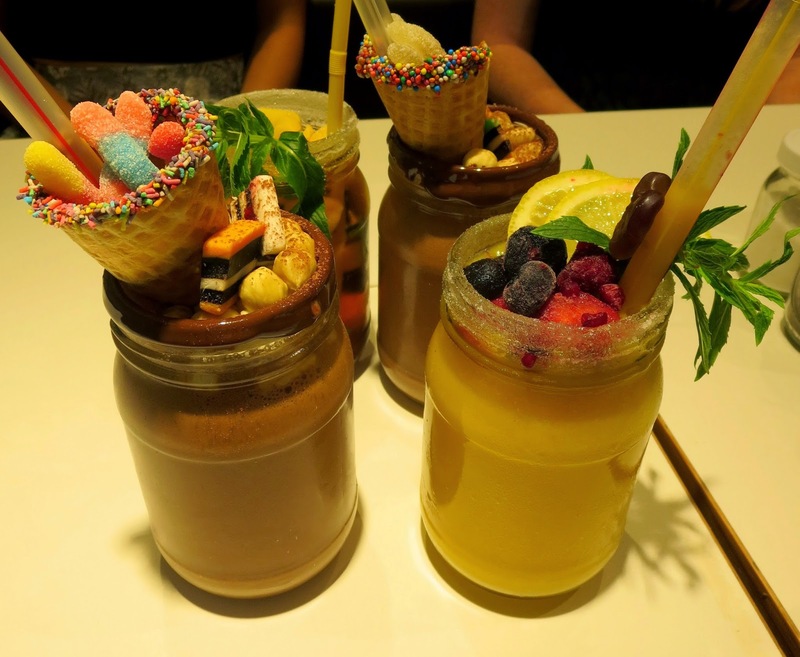 You had me at Nutella milkshake, YUM!!!! As soon as i heard nutella i was sold! Do you know if The Vogue Cafe has the same menu as Missing Piece Cafe?